Understanding the aesthetic benefits of using art-grade bronze finishes in residential, commercial, and hospitality applications. Identifying appropriate design options, functions, and mechanisms for hardware applications. 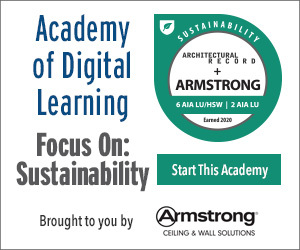 Knowing the sustainable qualifiers of art-grade bronzing versus non-art-grade bronzing, specifically in residential and commercial hardware applications. Describing a typical manufacturing process used to produce art-grade bronze finishes. Not all bronze hardware is created equal. Whether door, window, and cabinet hardware, tile, light fixtures, plumbing, or accessories, advances in high-end art-grade bronze—a sturdy, beautiful take on the classic alloy—can move residential, commercial, and hospitality projects to the next level from both a design and sustainability perspective. While a bronze finish often (and rightfully) conjures up a rustic, down-home aesthetic, trends point to its use in unique commercial applications, most notably in high-end spa, resort, and boutique hospitality facilities. 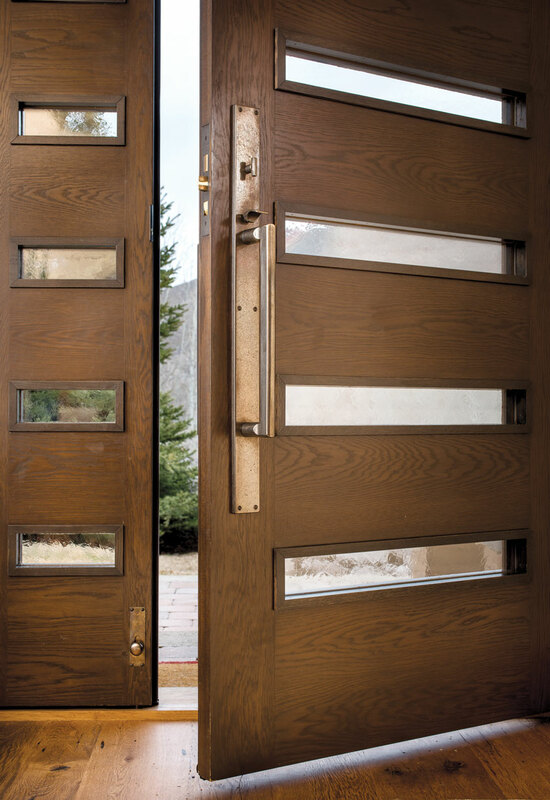 These custom glass and oak entry doors feature large thumblatch bronze hardware, shown in white bronze. Architectural hardware, overall, is an essential element for any building project, one that provides passage, access, and security, but whose operations we take for granted. The aesthetics of hardware design strongly influence our perceptions of the space we are in or the building we are entering. The architect and designer’s selection, application, and specification of architectural fittings will make a critical contribution to the project’s overall success. Over time, hardware has evolved from crude, handmade attachments and closure pieces to machine-made, industrialized mechanisms of great precision and design distinctiveness. Most recently, there has been a trend in high-end hardware toward unique design, which combines highlighting the natural properties of the bronze from which hardware is cast with its sculpture sense and precision-engineered properties. Hardware, which typically consumes a relatively small percentage of a building’s construction budget, represents an annual construction value in the billions of dollars. This course concentrates on high-end art-grade bronze hardware for residential, commercial, and hospitality locations. It will familiarize you with the trends, the process, the criteria, and the design decisions that enable the correct selection and specification of hardware for these applications. Selecting the best hardware material that can function under varied climatic conditions while maintaining basic design characteristics has become increasingly challenging. Steel, stainless steel, and aluminum all have their applications, but none can combine resistance, durability, a natural aging process, and a natural appearance the way bronze can. Bronze has several favorable properties when used for hardware. It is nonferrous and will not rust. Bronze interacts and ages well, working in coordination with time, touch, and climate. Over time, the material distinctly reflects its surroundings. It ages naturally but is quite durable and robust. Additionally, bronze can be tempered by various applied patinas, which can speed the aging process to create unique hues to complement any style. That said, the quality of the bronze used can make all the difference in meeting specialized project goals. Products cast in solid bronze (art-grade bronze) provide top quality in terms of different elements of the alloy. Perhaps the best way to describe the high quality of art-grade bronze is to say it is what you would find in an art installation or a statue. The alloy when heated allows it to pour nicely, and with some manufacturers’ products, there is as much as 90 percent post-consumer recycled content (post-consumer waste is that which typically goes to a landfill) in the bronze, taking into consideration a small percentage for the lock mechanism and other nonrecycled subassemblies. Bronze is actually an alloy, or a mix of several different metals that are heated together. The individual metal components and their ratios vary based on the desired quality and color. Commonly, bronze is a mix of copper and tin, but fine art-grade bronze is predominantly a mix of copper and zinc, with other elements added in smaller quantities. 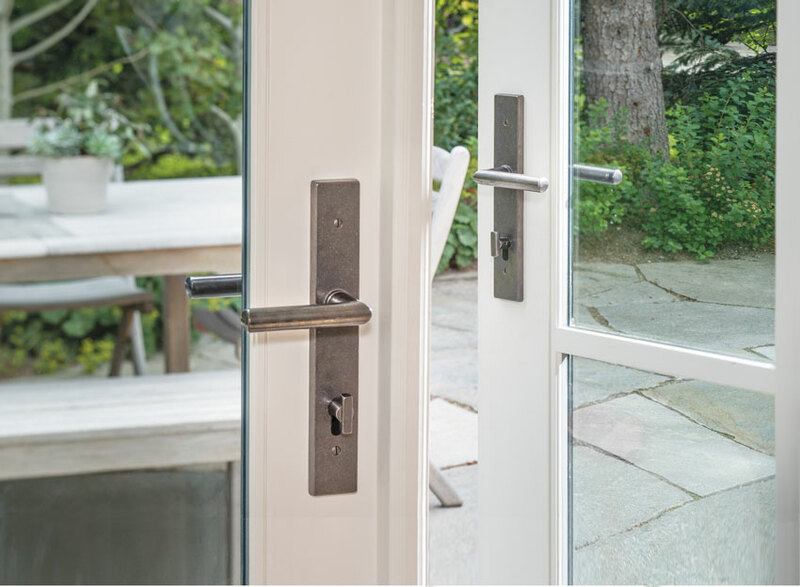 For architectural hardware, two common art-grade alloy compositions are suitable for both decorative and functional high-quality installations. The first and probably the most common composition is referred to as silicon bronze, even though it contains only 4 percent silicon compared to 6 percent zinc content, and the remaining 90 percent, or the overwhelming majority, comes from copper. This produces the commonly pictured coppery gold color that ages to a deeper, rich color that most people associate with bronze. A second popular choice for hardware where lighter natural colors are desired is referred to as white bronze or tombasil. This alloy composition contains much less copper at 56 percent, but much more zinc at 24 percent. In addition, manganese (13 percent), nickel (5 percent), aluminum (1 percent), and lead (1 percent) are added to create the desired silvery color and other properties. Art-grade bronze hardware can provide durable, aesthetically unique options for a variety of projects and applications. Shown here is contemporary multipoint door hardware in white bronze. Durability: Bronze is a nonferrous material, meaning that it doesn’t rust the way iron and steel can. Corrosion resistance: In addition to being extremely durable, bronze offers excellent resistance to corrosion. Fatigue resistance: Since bronze oxidizes only superficially, it resists metal fatigue and corrosion (especially seawater corrosion) better than steel. As a particularly dense alloy, it offers high-strength capacity in stressful environments. Lower melting point:Copper-based alloys such as bronze have lower melting points than steel or iron and are more readily produced from their constituent metals. Easy care and maintenance: Ideally, bronze surfaces should not be treated with a harsh cleaner. However, to help it age gracefully, bronze can be cleaned with mild soap, water, and a nonabrasive cloth. As a material, then, bronze has remained a reliable, durable, and sustainable material for a dramatically long time and continues to be so today, using both time-tested and innovative manufacturing techniques. Given these features, high-quality art-grade bronze finishes can also contribute to a project’s sustainability goals. Architectural hardware is a significant part of many residential structures and even more so for commercial buildings, particularly in hospitality settings. Hotels, resorts, restaurants, and related building types all rely on properly controlling the flow of people and goods to maintain privacy, security, and operational success. Typically, this control requires well-designed and durable hardware systems that include door and window operating and locking components. From a design standpoint, the selected hardware needs to be consistent with these operational demands, as well as with the overall design vocabulary of the building. Further, since all manufactured metals have an environmental impact, the selection of hardware that is made from predominantly recycled material by manufacturers using green and sustainable practices is paramount to green building design. Architects and other design professionals are increasingly finding that art-grade bronze architectural hardware meets all of these demands. As a long-standing traditional metal, it has proven its characteristics of durability and sustainability. 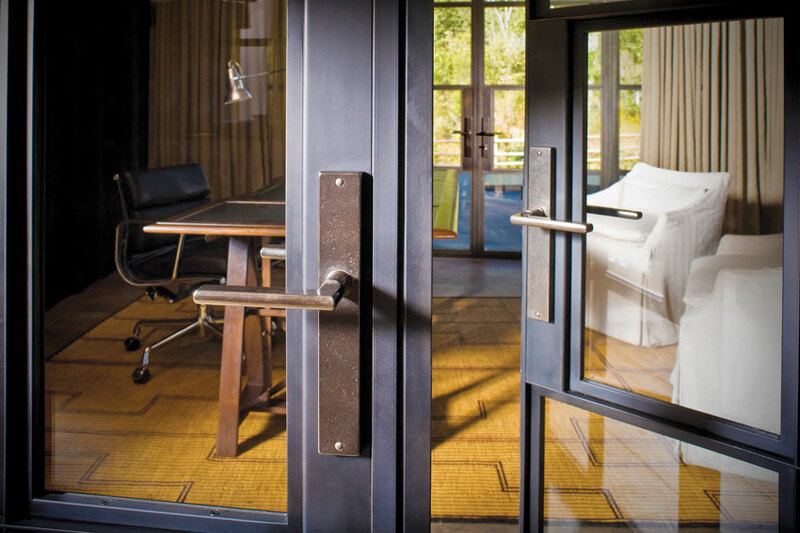 Modern manufacturing methods combined with this historical strength allow residential, commercial, and hospitality facility designers and owners to reap the benefits of the old and new characteristics of bronze architectural hardware. The art of crafting bronze products begins with the casting process, where the material is hand poured from a crucible into a mold, creating the raw bronze shapes referred to simply as castings. Once cooled, these castings are then given to the experienced hands of skilled craftsmen for detailed finishing of every surface. Although the casting process can be very labor intensive, the payoff can be seen in the value, durability, and long life cycle of the products. 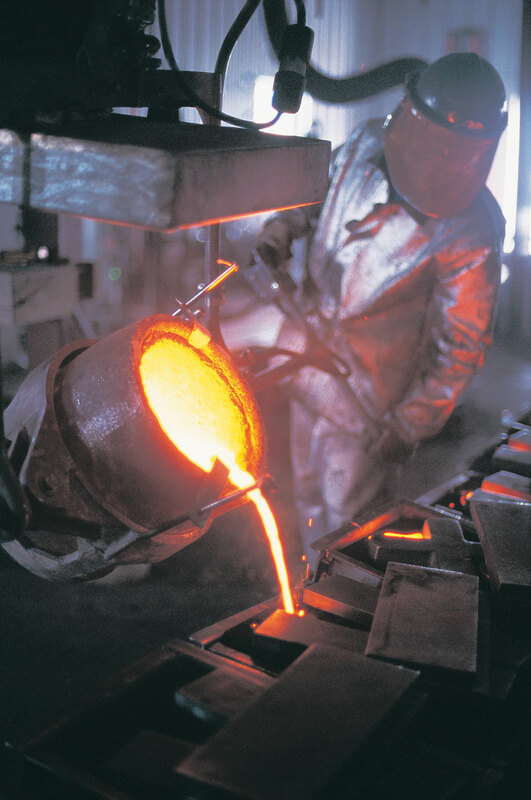 Molten bronze is poured from a crucible into a mold. Given the versatility of hardware finished with art-grade bronze, there is an abundance of design options that can be carried through a project. This continuity of design, whether in residential settings, commercial spaces, or hospitality facilities, gives designers tremendous freedom to create nearly any look required utilizing high-end products. The architectural style choices available today cover a broad spectrum, spanning from modern and post-modern to period, rustic, traditional, and even transitional. Each style and design vocabulary requires details that work together to provide a harmonious appearance. 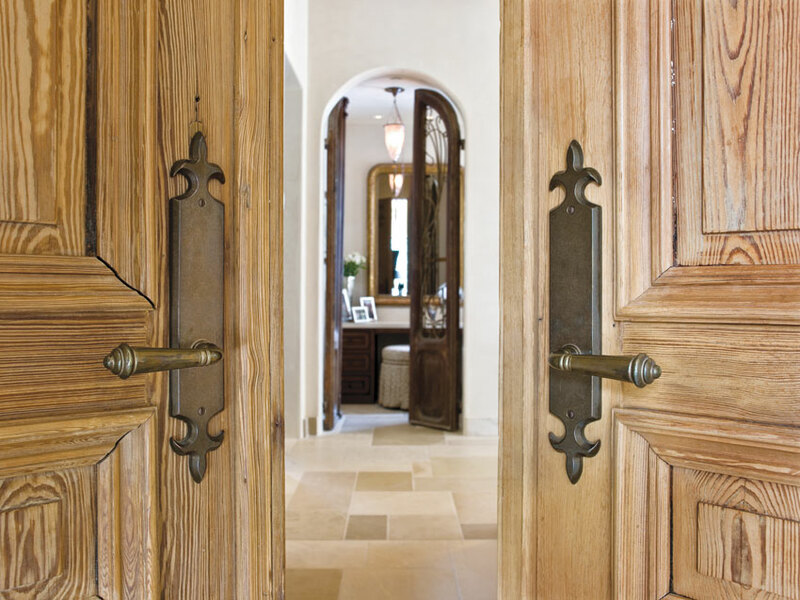 Classic Fleur de Lis hardware in silicon bronze medium was used for these reclaimed oak doors. Clean-lined multipoint hardware on these interior office entry doors features a white dark luster finish.